Welcome back. We are at #5 now. And I am sure this is the big one most people are waiting for in this industry. How do the PROs make money? It has not been that easy reading about how people make money in their OWN industry, and trying to explain it to others. Like I already told you at the beginning of this series (Table of Contents), I don't make money from the 40 ways. No body does - that is absolutely IMPOSSIBLE. I am only using the knowledge that trading stocks/Forex (which I have done for over 8 years now as a hobby) and sports betting have so much in similarity to explain this industry's money-making strategies in detail. So I am not telling you 40 different ways in which I make money online. (But I will show you the ones I am into and those I am seriously considering/working on, apart from, of course, blogging). 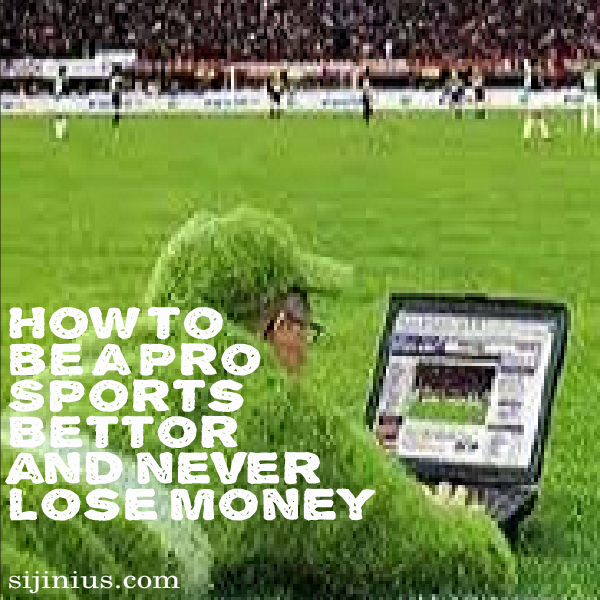 With that intro, I think I am qualified and justified to show you how Sport Betting PROs make money online. Please note that I will not be talking about how to make money in online casinos, neither will I be delving into the different sports specifically. No expert will even do that for you. You choose the sport(s) you want to bet regularly on, especially based on your interest, knowledge and available signals/tips from experts that you can get in the sport(s). But even if you do not have any interest whatsoever in a sports, say water polo or American college football, you can still bet on it, by simply listening to the PROs and copying their own bets. But it is best you choose one, narrow down your focus even further in that one you have chosen so that you can become an expert in maximum of 3 years. Develop a personal strategy, and stick to that strategy with 100% discipline, 100% of the time. For money/bank roll management, the PROs use different betting strategies for staking, but mostly combining the Martingale system with Fibonacci, or with Proportional/compounding betting system. Other betting strategies include Fixed wager betting, and a system of waiting for a 'sure bet' and then betting a large sum once and hoping for a one-off hit then repeating the process all over again (like a typical novice gambler will do - too risky. I see many young Nigerian men do this hoping to become millionaires in the process. Even if they MISTAKENLY become millionaires using this method, THEY CANNOT REMAIN MILLIONAIRES using it. They will only become problem gamblers/develop problem gambling in the long haul). You follow/subscribe to multiple signals or experts in your chosen sport(s) - 3 or 4 should be enough, who will give you 'sure bets' within the odds range of 1.4-1.75 odds (European odds system). You decide how often you want to bet - daily, twice daily, weekends only, etc. You decide which sports or teams or players, you want to bet on, and on which days (more like having a time table), or which tournaments you will look forward to. You use the Martingale system for setting the betting amount for bets, for a maximum of 3-4 losses in a row, labeling them A, B, C, D (he uses 3 actually). When you get to bet D, if that one too results in a loss, no matter how much you lose, you will go back to amount A on your fifth bet, and start again. You will religiously keep a diary/record of your bets, for feedback and improvement. You will not bet with more than 5% of your total capital. He recommends 1-2% if you are using the Martingale system for up to 5 rows of losses. The betting amount you choose is called a unit. For example, if you start with $1000 (N165,000) and you want to run up your losing streak to a maximum of 4, then you will regularly bet 1% or $10. So your unit is $10, and you will have doubled up to $80 by the fourth loss in a row. But by the fifth bet, you will go back to $10, no matter what (100% discipline). The whole idea is that you cannot have a losing streak of 8 games in a row using your strategy of getting 'sure bets' from your signals-combination. If that ever happens, you might have to reconsider your choice of signals/decision making. I hope this gives you an idea of how a typical Pro makes money in this industry? Ok let's delve in fully. You can see that this is more like an investment and trading, more than 'haphazard gambling'. 5. Be a Professional, and ‘never lose money’. Take your time to understand the industry. Learn how to calculate odds, and beat the probability of odds mathematically. This implies that you must be good in mathematics/arithmetic anyway, and be extremely patient -content with making little profits per time, which will then accumulate over time. Or follow another professional by copying his bets, advice, and style till you become a professional yourself, Or pay for/use a software that will do that for you. There are also many websites and apps that offer free sports tips which can guide you. Do all you can to make far more than you lose! 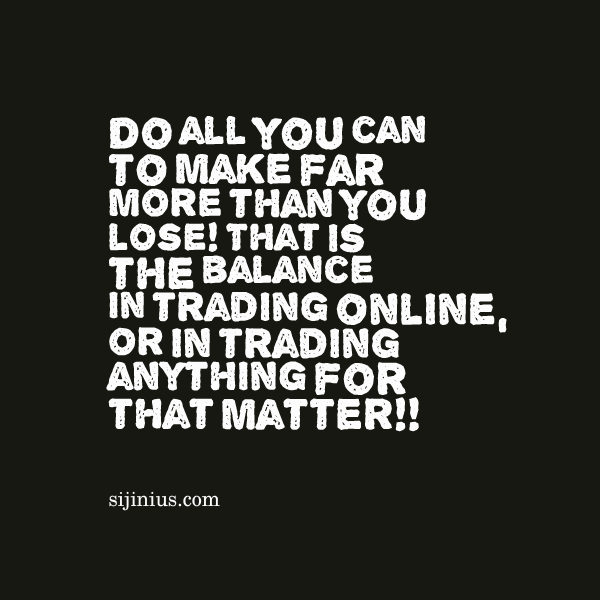 That is the balance in trading online, or in trading anything for that matter!! This is obviously a whole industry that people have spent their whole professional life trading and involved in, so I can’t cover it all in few words with two or three 1000-words articles. But what I will give you are tips, guidelines that can help you start to make money immediately if you want to start now-now. I particularly like the simple and concise way most of the articles in pinnacle sports on betting are written. Please be ready to read something daily about the industry. The good thing is that among its many advantages, sports betting isn’t time consuming. Once you have placed your bet, unless you want to watch the game, you can just go and research the next game. The main work is in properly doing your research BEFORE the game. (Pinnacle sports is not available to Americans, I learn). Read more from Shawn Konig, another expert in the industry on his own strategy, posted publicly; Sports investing secrets. In my next article, I will give you a list of some paid international signal providers that you can subscribe to and how you should combine them to get "the winning sure bet" (tip). I will also discuss arbitrage betting extensively and the software you can download to make your life easy making money with this method. Don't forget that as a Nigerian, you need to follow local sports experts like Segun Agbede, and some other Nigerian tipsters to know how to get 'sure bets' for the Nigerian league, African Champions league, etc. What I found online were experts/signals using advanced information-gathering processes on American football, Ice hockey, NCAAF, NBA, UEFA champions league, etc. Hopefully we will get there in Nigeria. [I have gone through their blogs and I do not advise you to buy anybody's strategy. I have not been able to either contact them personally or those i contacted have not replied. But I will let you know once I do. 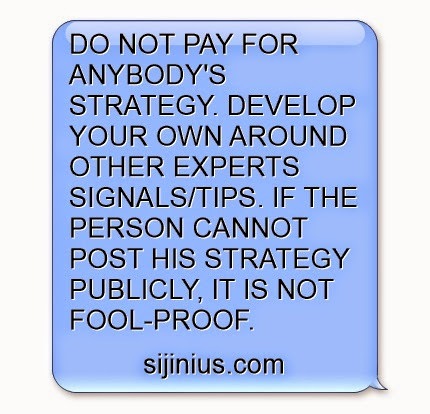 If they cannot publicly post their strategies, then it is not fool-proof.